Although office suites have been available on mobile phones for more than a decade, touch interfaces have made them much simpler and more efficient than before. Now, iPhone and Android users wanting to work with office documents while on the go have at least three great options each, and two of them in common. This guide will walk you through the process of choosing an editor and getting started in editing documents on your smartphone. Both Documents To Go ($10) and Quickoffice Pro ($15; a stripped-down iPhone-only version is available for $10) offer a full editing suite for Word, Excel, and PowerPoint documents. The extra $5 for Quickoffice will be well worth it to some people, as that suite offers the extraordinarily convenient option to sync documents with cloud hosting services such as Dropbox automatically. This feature is terrific, since it allows you to keep all of your documents up-to-date without having to plug your phone into your computer. Of course, the choice is yours--Documents To Go has plenty to recommend if the automatic Dropbox sync doesn’t appeal to you. One aside: If you're new to cloud storage, you could do worse than signing up with Dropbox. It’s one of the most popular cloud storage services--almost a household name by now--and it gives you a nice 2GB of storage space for free. By default the desktop installer will create a Dropbox folder within your Documents folder, and unless you have reason to be concerned about cloud security issues, I recommend keeping the majority of your documents in there. Not only will the Dropbox folder provide seamless access to your files on your phone, but it will also help to keep them safe in case you ever experience a hard-drive failure. Getting started with Quickoffice is as simple as tapping the Accounts icon in the bottom-right corner of the start page, and entering the credentials for the cloud service of your choice. You’ll need to log in only once. After you’ve done so, the interface for opening documents is simple: Either choose an application (Quickword, Quicksheet, or Quickpoint) and a document (from your Dropbox folder or from your phone’s storage), or skip the first step and use Browse or Search from the start page. The Documents To Go interface, lacking Dropbox support, is even simpler--choose the type of document, and then browse your device or select an item from a list of recent docs. Editing documents in Quickoffice Pro (left) and Documents To Go (right). The document editing interface in both Quickoffice Pro and Documents To Go is fairly clear and consistent on Android and iPhone. Both suites allow you to highlight, cut, or navigate the text by tapping and dragging anywhere in the main body, and both have a menu of formatting and saving options accessible from the bottom of the screen (or the Menu key on Android). The Quickoffice menu scrolls to reveal a familiar Undo arrow, an invaluable tool. The spreadsheet editors have a few differences. In Quickoffice, most of the options for copying or inserting cells are located in the bottom toolbar. You access an Excel-style function menu by clicking the function icon at the top of the screen, which reveals an elegant function-search wizard. In contrast, Documents To Go handles these kinds of things through a comprehensive Insert pop-up menu on Android, and via the bottom toolbar on iPhone. Of course, you can still enter functions manually in either case, and you can resize or copy cells by tapping or dragging anywhere within the main interface in either application. Documents To Go’s slideshow editor is pretty convenient if you’re working on a presentation that consists mostly of text, since it allows you to do all of your work on a single outline (by opening the View menu and selecting Outline View) without needing to scroll slide by slide. This design, however, masks the fact that the app can’t do much in the way of editing slide layouts--which is both a blessing and a curse. By comparison, Quickoffice Pro allows you to add many simple shapes from the menu in the bottom corner, each of which you can resize by dragging their corners, just as on the desktop. The butterfly icon allows you to import photos from your phone. 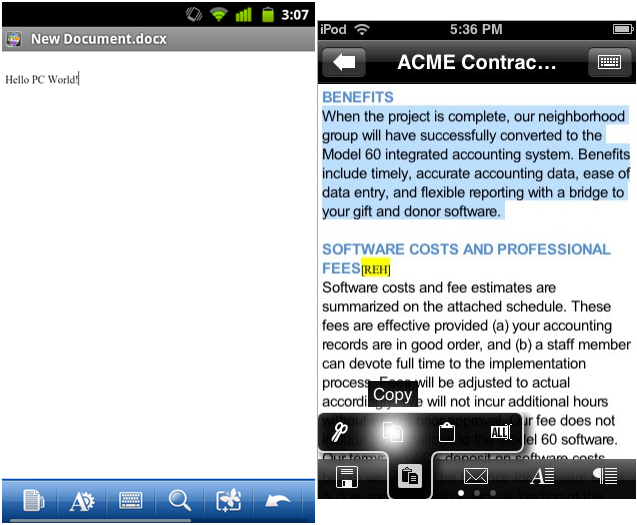 For editing documents on Android, the Google Docs app works in a pinch. After Documents To Go and Quickoffice, Android users’ third option (and their only free one) is the official Google Docs app. While it’s simple enough to use--virtually all of the menu items move you to a list of your online documents, and from there it’s just one more click to Google’s famously bare-bones editor--it doesn’t allow you to work on any documents that you haven’t already uploaded to Google. Unfortunately, it also refuses to let you export or email documents in Word or Excel format, the way the full desktop interface does; you may only invite other Google users to edit them (via the Invite pop-up menu). For this reason, the app is a bit of a niche choice, though if your colleagues are amenable to the Docs interface, it helps that this program is free. 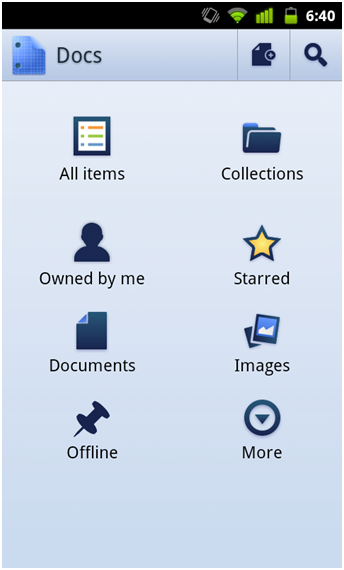 Veteran BlackBerry users will likely remember Documents To Go, which has served as a free document viewer since OS 4.5, released in late 2008. As of OS 7 (late 2011), the full version of Documents To Go, which allows editing of documents, is now free--saving users at least $50, and effectively killing its remaining competition. The app's victory is well deserved, as it’s difficult to imagine a better package for working within BlackBerry phones' relatively small screens. Documents To Go installs as four separate programs--Word, Sheet, Slideshow, and PDF--within the 'Applications' folder. After opening any of the programs, you’ll see a straightforward prompt to open an existing file or create a new one. On other occasions, you’ll likely find yourself wanting to open email attachments, which you can do by highlighting them within the mail application, pressing Menu, and then selecting Open Attachment, which will shepherd you directly into Documents To Go. Document To Go's spreadsheet interface. The app is fully compatible with Office 2007 documents, and it supports many important smaller features such as Word’s Track Changes functionality (available under Menu and then Show Changes). 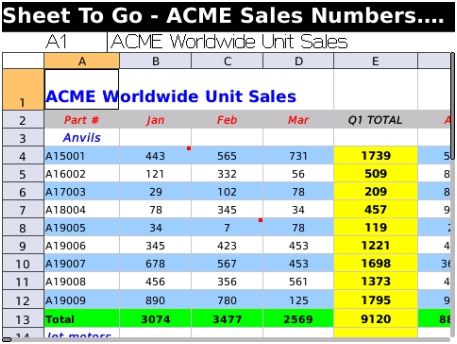 On spreadsheets, users with touch-capable phones will have a much easier time with scrolling, although shortcut options are available from the Go menu to help other users jump around. Slideshows, however, get short shrift: Most slide transitions from PowerPoint are not preserved on the BlackBerry, so I recommend that you work only with simple text-and-image slides. Although Documents To Go can’t wirelessly synchronize documents, if you're a Windows user you can download an application that does the job each time you connect the BlackBerry to a PC, with only a couple of clicks. You might also make judicious use of the 'Send via Email' function, which is located adjacent to the Save menu--most modern email services make for fine cloud-like storage in a pinch.